Painting Acrylic on Canvas | 39" x 37"
Painting Acrylic on Canvas | 70" x 46"
Painting Acrylic on Canvas | 54" x 44"
My work is filled with dream like creation, rhythmic flow and artistic beauty. The female figures in my painting seem to be in a sea of spirituality. To understand my work, one must fully understand the atmosphere in which my characters are placed as it's a kind of treat to do so. I try to paint something different all the time and use a multitude of colours to express my thoughts and feelings on a canvas. Madan Lal was born in Talwandi Bhai, Punjab, India. He received his B.F.A. Degree from the government college of art, Chandigarh. He is inspired by the mysteries of Sufism. In 2001, he won a gold medal in the all India exhibition by Avantika, New Delhi. In 2000, he was honoured by the All India Millennium Drawings by PLKA & Lalit Kala Academy, New Delhi and in the same year he was also awarded by the Punjab Lalit Kala Akademy. 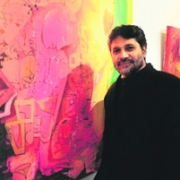 He has also participated in many solo and group exhibitions held at Jehangir art gallery, Mumbai, Lalit Kala academy, Chandigarh, Habitat Centre, New Delhi. Hos work has also been showcased in Kolkata, Indonesia, Sweden and U.K.